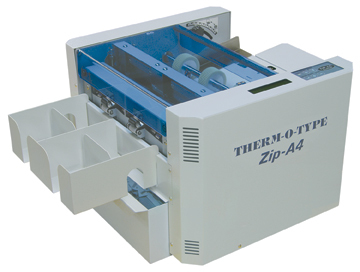 THERM-O-TYPE Zip-A4 programmable cutter/slitter is ideal for crosscutting and inline slitting 10-up business cards sheets. Sheets are automatically fed through a high capacity friction feeder with a micro side to side registration control. As each sheet is fed into the machine, the Zip-A4 can optically register the sheet from the lead edge or a registration mark. Mark registration mode automatically compensates for any up and down image bounce from the printer. After registering each sheet, a programmable guillotine cutter removes the lead edge scrap and crosscuts each pair of cards across the sheet. The final crosscut removes the tail edge scrap. The Zip-A4 can be programmed to “scissor” or “gutter” crosscut as required. Crosscut cards are then advanced into the rotary slitting cassette where the side edge scrap and a 6 mm (.236″) wide center gutter is removed. Crosscut and slitting scrap is directed into a collection tray. Finished cards drop into receiving tray for collection. The combination of programmable crosscut gutters, lead, tail and side edge trim off, and center slit gutter allow four sided bleed cards to be easily and accurately produced in one pass through the Zip-A4. Combined with a laser or ink jet printer, the Zip-A4 allows low volume business cards and other multiple-up products to be produced with ease. Programmable guillotine cutter (inches or millimeters). – Maximum paper width 8 1/2″. – Removable blade cassettes w/slitting blade positions pre-set.